This isn’t just another diet book? The information this book contains is gimmick-free and works. It gives you a new way of thinking about food where you’ll understand that your body needs to work in harmony with what you feed it. So isn’t this just another diet book? What’s new about this one? Lots. For a start this book is not about your blood group, your body type, your Zodiac sign, or the initial letter of your first name! There are no gimmicks in this book which is why the information works. You will lose weight and this time you will keep it off. I am not going to give you a diet to follow for a while only to have you abandon it for your old eating patterns once you have reached your goal. This book will introduce you to a way of eating that is enjoyable and nourishing while allowing your weight to reduce naturally over time and then remain stable. What all dieters want and need is a way of eating that is a way of life. And preferably an enjoyable way of life. This book will take you to that new life. It’s all about a way of eating that allows you to have a life! To eat comfortably at home with family and friends but also to be able to eat out in restaurants. On this ‘diet’ you can have a normal social life! This book will also advise on exercise not just as an aid to weight loss but also to benefit your general health. It will show that exercise can be woven into your everyday routine in ways that you might not have thought of before. Included in this book is information on different tests that can pinpoint what may have affected your ability to lose weight in the past. If you know you are among the millions who live to eat, then prepare yourself for a major life change. You’ve bought this book, you obviously want to escape the treadmill of never-ending dieting but of course you still want to lose weight, in fact you want to lose fat. With this way of eating you will. Get ready to turn your life around and start eating to live rather than living to eat. You’ll be amazed at the difference. Chapter 5 – Still can’t lose weight? 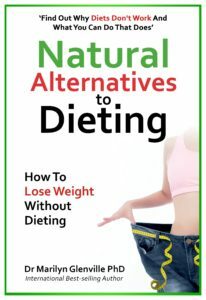 Natural Alternatives to Dieting Book at The Natural Health Practice. "Natural Solutions for Dementia and Alzheimer's"
"Osteoporosis - How to Prevent, Treat and Reverse it"
"The Natural Health Bible for Women"
"Healthy Eating for the Menopause"
"The Nutritional Health Handbook for Women"
"Overcoming PMS the Natural Way"